Uninstaller software, in case you didn't know, is software you install for the purpose of uninstalling other software programs. Confused? It does seem a little strange to install a program whose sole purpose is to remove other software, especially since you can uninstall programs easily from Control Panel with the Programs & Features applet. So why use one? Uninstaller tools are great when a program won't uninstall normally (more common than you think) or when you suspect that a program didn't uninstall completely (even more common). Some uninstaller programs even improve on the program uninstall process in general by doing things like monitoring the install process to ensure a complete uninstall when you're ready, by adding easy "uninstall" options to programs via the right-click menu, and lots more. If you're having trouble finding a free uninstaller software tool that will completely remove your antivirus program, see the last item on this page for some specific suggestions that should be very helpful. With IObit Uninstaller you can search for installed software, find and remove the programs taking up the most space or the ones you hardly use, uninstall browser toolbars and plugins, remove downloads made from Windows Update, and even see which of your programs could be updated to a newer version. The best feature in IObit Uninstaller is the right-click context menu integration. You can right-click any program on your desktop and choose to remove it with IObit Uninstaller, without ever having to find the program's uninstall utility yourself. In fact, you can even use the Easy Uninstall feature to delete programs that are running. Just drag the green dot on top of the program window and IObit Uninstaller will know exactly what to do to remove it. After a program is deleted, you have the option to scan the registry and file system for leftover data that the installer may have missed, which is a great way to keep your computer free of clutter. This is also true if you uninstall a program without using IObit Uninstaller — it will still prompt you to remove any leftover files and registry items that the regular uninstaller might have missed. IObit Uninstaller can also create a System Restore point before making any changes, includes a file shredder, can force-remove a program, supports batch uninstalls, deletes bundled programs, and includes other useful tools, too. IObit Uninstaller runs on all recent and older versions of Windows. This includes Windows 10, 8, 7, Vista, and XP. Geek Uninstaller is a completely portable program uninstaller that's packed with features, all in a file less than 10 MB in size! Sort programs by their size or installation date, delete entries from the list of software, search through the programs, export a list of installed software to an HTML file, and look up information on any program in the Registry Editor, install folder, or internet. You can also forcibly remove a program by eliminating any reference to it, both in the registry and file system. Some features in Geek Uninstaller, like batch uninstalls, unfortunately only work in the professional version. Geek Uninstaller can uninstall programs in Windows 10, 8, 7, Vista, XP, and Windows Server 2008/2003. Wise Program Uninstaller, like some other uninstallers here, supports an easy way of removing programs by via the right-click context menu in Windows Explorer. After Wise Program Uninstaller is finished deleting a program, it will automatically scan your computer for any remaining registry entries or files that may have been left over. Forced Uninstall is a feature in Wise Program Uninstaller that can force a program to be removed if you've already tried using the software's regular uninstaller but was unable to properly get it removed. Wise Program Uninstaller can also remove program entries from the list of installed software, instantly search through all the programs, sort by install date or size, and includes built-in reviews submitted by other users. You can uninstall programs with Wise Program Uninstaller on Windows 10 through Windows XP, as well on Windows 2003 and 2008. Comodo Programs Manager. © Comodo Security Solutions, Inc.
Comodo is probably best known for their antivirus software, but they also have a wonderful program uninstaller called Comodo Programs Manager. The main feature in Comodo Programs Manager that certainly stands out is the way it monitors program installs. After installing Comodo Programs Manager, any new software install will be monitored in real-time to keep track of every registry and file system change. Then, when you're ready to uninstall the program, Comodo Programs Manager knows exactly where to look for a thorough cleaning. You can also restore a program from a backup if you accidentally removed it, remove programs from the right-click context menu in Windows Explorer, view the install folder of any program, and sort the list of installed software by name, company, size, the frequency of use, install folder, and install date. Comodo Programs Manager can remove Windows Updates, drivers, and Windows features in addition to regular programs. Comodo Programs Manager is only compatible with Windows 7, Vista, and XP. You'll need a different program from this list if you're looking for one that's compatible with Windows 10 or Windows 8. Comodo Programs Manager would rank higher on this list except that because it has been discontinued, it hasn't been updated since 2011. Another free program remover is Advanced Uninstaller PRO. This program is basically like the others in this list. Common features like scanning for leftover registry items, context menu integration, and a search utility are included. A feature called Monitored Installations is also available, which takes a snapshot of your computer before and after a program install. This allows Advanced Uninstaller PRO to easily identify the changes an install made, thus allowing it to remove every single file that the program modified during its installation process. The only thing I don't like about Advanced Uninstaller PRO is that it can seem very cluttered with all the extra tools it has, such as a registry cleaner and file shredder. Both 32-bit and 64-bit versions of Windows XP through Windows 10 are supported. Puran Software, the maker of a few other popular system tools, also has a free uninstaller tool called Puran Uninstaller. Puran Uninstaller is similar to some of the other programs from this list. It supports instant searching of installed software, batch uninstalls, force uninstalls, and allows individual program entries to be removed from the list of software. Puran Uninstaller can also verify a program's identity by utilizing code signing. If an application's signature is found by Puran Uninstaller to be different than the known signature of that particular program, Puran Uninstaller will identify it as untrusted. You can uninstall software with Puran Uninstaller so long as you're running any of the following versions of Windows (32-bit and 64-bit): Windows 10, 8, 7, Vista, XP, Server 2008, or Server 2003. Revo Uninstaller is another software uninstaller program that has both a regular installable version as well as a portable one. Hunter Mode is a unique feature that lets you manipulate a program by simply selecting its open window. You can uninstall the software, view its installation folder, kill the process, and even stop it from running at startup using this mode. When uninstalling a program with Revo Uninstaller, you can run it in advanced mode, which scans the file system and registry for leftover items that are no longer needed but didn't get properly uninstalled with the built-in uninstaller. You can then delete some or all of the leftover items. Automatic restore point creation is a big plus. Also, there's a junk file cleaner and privacy cleaner included, among other extra tools. I like Revo Uninstaller, but because there's also a professional version, it lacks a handful of the same features you'll find in some of the other uninstaller tools from this list, like removing partially uninstalled applications and support for batch removals. Windows Server plus Windows 10, 8, 7, Vista, and XP users can use Revo Uninstaller. CCleaner is best known as a free registry cleaner and junk file removal program, but it can also be used as a free software uninstaller. You can search for installed software, remove and rename entries from the program list, and sort by name, installation date, size, or version number. It's a wise choice to use CCleaner for removing programs because you can quickly switch over to its file and registry cleaner to sweep up any residual files that an uninstaller may have left behind. Open CCleaner's uninstaller from the Tools menu, where you can find other useful tools like a duplicate file finder, hard drive wiper, and startup manager. A portable version of CCleaner is also available. CCleaner works with all Windows versions from Windows 10 down through Windows XP. In may also be compatible with older versions of Windows. Absolute Uninstaller is a free program remover from Glarysoft, the same developers of Glary Undelete, a very popular file recovery tool. Batch uninstalls are supported so you can check multiple programs to remove them each consecutively, and newly installed programs are clearly marked as such. Absolute Uninstaller has an AutoFix invalid entries option in the menu that can scan all the installed programs to find any that don't refer to an actual program you have installed. This may happen if you've removed a program in the past but the entry remained in the list of installed software. You can also modify the name of any of the listed programs as well as change the uninstall command line string. Absolute Uninstaller can also remove Windows Update installs and has a search function, though it's not nearly as good as the ones in most other programs I've reviewed here. Absolute Uninstaller can be used on Windows 10 through Windows NT, as well as Windows Server 2003. PC Decrapifier is a portable program that takes up less than 2 MB of space and supports batch uninstalls. An easy to follow wizard walks you through the process of choosing what you'd like to remove and lets you create a restore point before deleting anything. Some programs can be uninstalled automatically and very quickly. For others, you must uninstall them manually, clicking through their uninstall wizards like you would normally. While testing PC Decrapifier, I selected four programs I wanted to uninstall. Only one required me to walk through a regular uninstall wizard while the others were removed automatically without any prompts whatsoever. Next to each program is a percentage of other PC Decrapifier users that have removed that program, which is an awesome way to quickly determine whether you should also uninstall it. Unfortunately, PC Decrapifier provides no way to filter or search through the list of software. PC Decrapifier works with Windows 10, 8, 7, Vista, XP, and 2000. 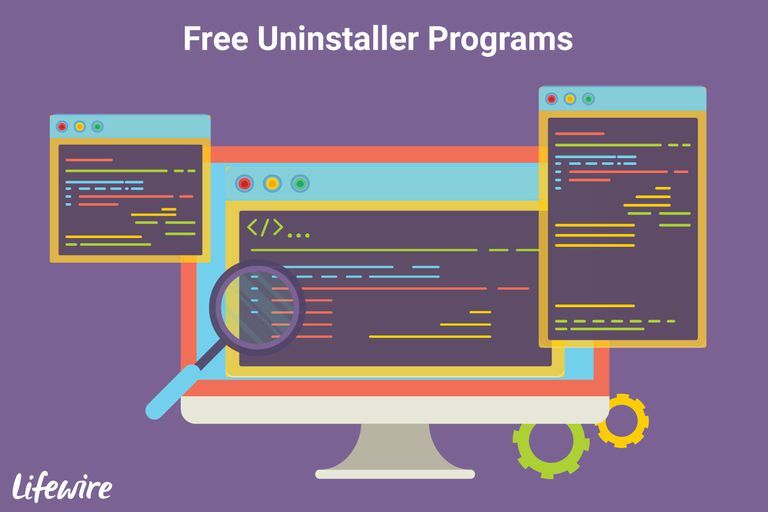 MyUninstaller is another free program uninstaller that's a bit simpler than the others in this list. It has an easy to understand interface that lets you export the list of programs to a file, remove application entries from the list, and sort all the software by name, version number, company, install folder, and install date. MyUninstaller can also be switched to an advanced mode that supports batch uninstalls. MyUninstaller is completely portable and is just 30 KB in size. You can use MyUninstaller with nearly all versions of Windows, including Windows 10 down through Windows 98. There are multiple reasons we've added Ashampoo's program to this list, one of which is for its ability to monitor program installs. Right-click a program you're going to install and choose to open it with Ashampoo Uninstaller, and it will record any disk writes and registry changes. The benefit to logging an install like this is so that Ashampoo Uninstaller can know exactly what happened to the computer during the installation, something that's of utmost importance if you plan to completely remove the application later. This also means you can remove the program with just one click. Ashampoo Uninstaller also lets you remove entries from the list of programs, clean up related files after an installation, uninstall programs in bulk, remove a specific application that was installed in a bundle, create what are called Snapshots any time you want to compare the state of your computer before and after any period of time (not just in relation to program installs), generate a report of installed programs, and group software together for easier management. Monitored installs and the Snapshots feature are helpful in other situations, too, like when you suspect that a program is doing something nefarious or malicious. You can browse through the logged data to see exactly what Ashampoo Uninstaller caught the program doing during setup, and the Snapshots function is perfect for seeing which files and registry items were added, removed, and changed between two points in time. Here are some other things you can do with this program that don't necessarily have anything to do with program uninstalls: clean up junk files, defrag disks, manage startup items, change file associations, permanently delete files and folders, find invalid shortcuts, and more. During installation, you're told that you need to enter a license key to use the software. Don't worry — it's absolutely free; just use the Get free activation key button to open the Ashampoo website and learn how to get it. I tested Ashampoo Uninstaller in Windows 10 and Windows 7 without any issues. It officially supports Windows 8, too. The installer for Ashampoo Uninstaller might ask you to buy some other programs from Ashampoo, either after installation and/or when you open the program. You can ignore those requests if you don't want to add anything else to your computer. ZSoft Uninstaller can analyze your computer before you install a program and then re-analyze it afterward. This creates a section of missing time ZSoft Uninstaller can then use to find what changes were made to the computer during the install. This would be a great feature to ensure that the uninstaller can remove 100% of the program, but it's painfully slow. While testing it, the initial analysis didn't complete even after an hour had passed. The interface of ZSoft Uninstaller isn't organized very well. You can only sort the list of programs by name and install date, but you have to find the option in the menu to do so (and even then, the result just isn't very satisfying). In short, ZSoft Uninstaller shouldn't be your first pick when choosing a good program uninstaller. I recommend trying any of the above programs in this list before settling here. However, I've kept the entry in our list because you might have better results. I tested ZSoft Uninstaller in both Windows 10 and Windows 7, so it should work with other versions, too, like Windows 8 and XP. OESIS Endpoint Assessment. © OPSWAT, Inc.
OESIS Endpoint Assessment includes a tool called the OESIS Removal Module (formerly called AppRemover). It's another software uninstaller with a limitation in that not all installed programs can be removed. Programs identified as antivirus software, file sharing applications, toolbars, and backup programs can be uninstalled with the OESIS Removal Module tool, but nothing else. The OESIS Removal Module tool uninstalls the above software silently, with no intervention on your part. It also supports batch uninstalls and automatically scans for leftover files and registry entries to ensure that the entire program, including all its references, are deleted. The OESIS Removal Module tool is a portable program, which means you don't need to install it to your computer to use it. The OESIS Removal Module tool should work with Windows 10 through Windows XP. Anvi Uninstaller is a very basic software uninstaller that has no unique features. It's completely portable, less than 2 MB in size, and can view all the installed programs in one list or see just the largest or most recently installed software. You can search for programs in the list as well as view any of the installed programs in Windows Explorer to know exactly where it's installed. A restore point is created before uninstalling a program, but that's the only other feature included. Batch uninstalls and scanning for leftover registry items, for example, aren't allowed. You can also remove Windows patches with Anvi Uninstaller. Anvi Uninstaller runs on Windows 10, 8, 7, Vista, and XP. Free Uninstall It is another program that can forcibly remove an application if it can't be removed by normal means. It does so by scanning for registry and file items that refer to the program in question, and then lets you remove them. One difference in this program and some of the other programs from this list that forcibly remove programs is that Free Uninstall It can remove software by an executable even if it's not listed in the list of installed programs. Fortunately, unlike some similar programs, there's an option to create a System Restore point before removing software with Free Uninstall It. An installation monitor is included with Free Uninstall It that's supposed to track how a program is installed to provide an easy way to remove it, but I was unable to get it to work properly. This program should work with Windows 10 down through Windows XP. Free Uninstaller is a very basic program that's basically no different than the built-in software uninstaller in Windows except that it's portable and supports batch uninstalling, among a few other things. You can search for programs in the list, look up software online to find more information, remove entries from the list of programs, and open the registry item that refers to the program. An HTML file can be created that includes tons of useful information in a really nice format, such as the name, publisher, size, frequency of use (even with the number of times you've used it), version number, EXE, icon file location, install location, and more. I tested Free Uninstaller in Windows 10 and Windows XP, but it should also work just fine with other versions of Windows like Windows 8/7. If you plan on reinstalling one of these programs after uninstalling the current version, make sure you've safely backed up the license information to avoid having to repurchase a product key. All the programs listed above should be able to remove antivirus software, but if not, the developer's dedicated uninstaller should do the trick. Since antivirus programs are integrated much more tightly into Windows to protect it from threats, removing these programs can be especially difficult for the general programs in this list. These dedicated uninstaller programs are used for removing the listed applications only. Using one when you don't have the associated program won't do anything. Uninstall Bitdefender: Bitdefender has a different tool for each product that needs to be removed. Uninstall Avast Products: Avast Free Antivirus, Avast Internet Security, etc.